You’ve got the car packed up with swim wear, beach toys, boogie boards, beach balls and other necessities a vacationing family needs. You’re in for a fun-filled week at Myrtle Beach and you’re taking your gun along with you, as always, to protect your family. But do you know South Carolina’s gun laws? Is your concealed carry permit valid at Myrtle Beach? Disclaimer: This article is now nearly 2 years out of date & since it hasn’t been updated, we strongly urge you to confirm all laws with the Law Enforcement Division of South Carolina or a knowledgeable lawyer. We don’t want you to accidentally break the law. Further, we are in no way liable for the information contained herein. Please check the facts yourself. If your state is not listed above or you don’t have a concealed weapons permit, you cannot conceal carry your firearm while in South Carolina. Like Florida, South Carolina bans open carry in most public places. If you do not have a recognized permit for South Carolina, your firearm may be transported (loaded or unloaded) in a closed glove compartment, console box or trunk. If you’re riding a motorcycle, the firearm should be secured in a closed saddlebag or other similar accessory container. While transporting your firearm on foot (such as to & from your beach cottage/hotel), the gun must be unloaded and secured in a closed case. One exception would be if you’ve already paid for your hotel stay (including any tax), you can carry a loaded handgun into your room. Licensed hunters and fishermen may also carry loaded handguns, while they are hunting and fishing, but do not need a permit to do so. My CWP is Valid in SC; Now What? Keep in mind that your permit is only valid for concealed carry, not open carry of firearms. There are no laws regarding where a gun must be located while in a vehicle. However, use common sense and keep it secured and away from little ones. Guns are not dangerous; criminals and inexperienced/careless users are. To carry a concealed firearm into a person’s private residence, you must first have their express permission to do so. Failure to receive permission can result in a misdemeanor charge. If convicted, you can get up to a year in jail and/or $1,000+ in fines. If you have a South Carolina concealed weapons permit, your permit must also be revoked for 5 years. A person who carries a concealed weapon into a bar, restaurant or other place of business that serves alcohol by the drink must have his permit revoked (if he has an SC permit), his firearm confiscated and can be fined up to $500 and/or get 90 days imprisonment. Keep in mind that only recognized CWP holders may carry firearms in state parks. Immediately upon official contact with any law enforcement officer, state law requires you to inform the officer of your permit status and if you have a gun. Remember, while it is a good idea to also inform the officer of your firearm’s location, do NOT reach for it – that’s a good way to get yourself shot. South Carolina’s firearm laws are uniform throughout the state, so you won’t find each city & county with a new set of rules. Myrtle Beach laws are no different than any other location in South Carolina. 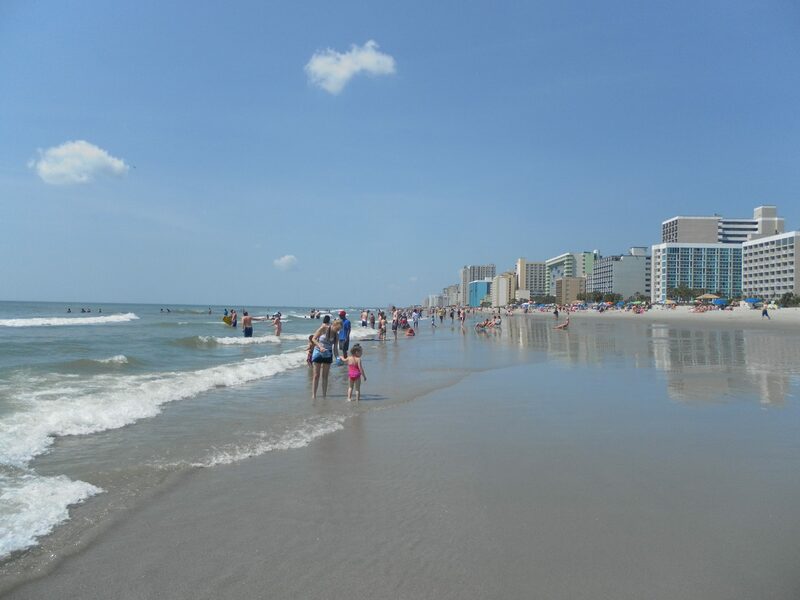 So kick back and enjoy your Myrtle Beach vacation – you’re in the midst of a gorgeous haven! Note: Please realize gun laws change constantly. We are in no form liable or responsible for the information contained here. While we strive to provide up-to-date, valid information, it is your responsibility alone to get in touch with the Law Enforcement Division of South Carolina to confirm laws and other regulations. Thank you! Carrie Thompson, who proudly exercises her 2nd amendment rights on a daily basis, is also an avid beach bum who can’t pass up a chance to visit the sandy shores of the east coast. For deals on Myrtle Beach hotels, resorts, restaurants, local attractions, news, events and more, check out Vacation Myrtle Beach. You can also circle Carrie on Google+. Great article Carrie, I never thought about going for the 30-State permit. I’ve already located a local Bail Bond company that offers personal classes for the certification, then I can apply through Florida or Utah (and Oregon because they’re not yet on the 30-State list). Thanks again! I actually don’t have a permit in SC, John. I’ve got a Virginia resident & a New Hampshire non-resident; only my VA permit is valid in South Carolina, though. I’ve downloaded a few apps to help: Legal Heat and USA Carry are my favorites so far. D. Sea, Apps are cool. 🙂 I know the feeling with calling various departments and being unable to talk with a real human. I think the worse state I’ve found for that is IL – their phone line is ALWAYS busy! to carry into my room legally and not violate the “Restaurants or any other establishments serving alcohol” restriction? Hi Robert, I’m afraid that’s a question for a lawyer! And I’m no lawyer. 😉 Personally, I wouldn’t consider it violating the law to have a gun in your motel room, but I wouldn’t carry your pistol down to the pool or that area of the motel. The issue here is the definition of “establishment” in the wording of the law. One factor could be whether the pool is indoor or outdoor. If it’s outdoor & the term “establishment” is interpreted to mean “building”, then I’d think the pool/bar would be considered a separate establishment. If the term “establishment” means “company” or “property”, then the pool, bar & motel would likely be considered one establishment. I know it sounds confusing, but we’re nit-picking the definition of the law here. Also, if the alcohol is served by a 3rd party (the motel itself doesn’t own the bar, but rents to another company or something), then the bar is likely a separate establishment. Without being a lawyer or studying some SC case law regarding “Restaurants or any other establishments serving alcohol”, I can’t really answer your question for sure. If you’re concerned that having your gun in your motel room would be violating the law, then I’d leave the gun in your car. However, you MUST lock it up!! And hide it out of sight. Because you’ll have out of state plates & you’re at a motel, it would be logical for a thief to target you. After all, you’re more likely to have valuables. One word of caution – the penalties for breaking this law are VERY serious. According to this article below, you can face a fine of $2,000 and/or 3 years in jail. This fine & jail time disagrees with the numbers from the SC State Police that I provided in my article above when I wrote it last year – I don’t know which is correct. Either way, the punishment seems pretty severe & I wouldn’t mess around with it. Sorry I couldn’t really answer your question beyond my educated guess/opinion, but I think this is a gray area of the law. Unfortunately Carrie the majority of law is a “gray area,” especially if there’s no prior case law involved. I suspect this is done on purpose, as a large number of lawmakers are former lawyers themselves, they insure plenty of business for their ilk. Yes, gray areas of the law are a headache for any law abiding gun owner just trying to figure out right from wrong. Some states are really crazy, like Alabama. The law reads that Open Carry is OK, so long as you have a permit. While confirming another gun law via phone with the State Police, they tipped me off that many of the counties don’t allow open carry so be careful. EVEN though that violates state law (laws are uniform throughout the state) & it’s illegal for the counties to do that. I decided not to be a case law situation and thus CCW’d the whole time. Fun gun laws for sure! 😛 Sigh. Your article is very helpful. I and my family will be staying in a rented beach house for a month this summer. I have a PA carry permit as well as a Utah non-resident permit, so I cannot legally concealed carry in SC. If I understand correctly, I can legally transport an unloaded and secured handgun as a nonresident and may keep it loaded in my rental for personal defense. Am I correct in this interpretation? I had planned on taking a shotgun as a house gun, but would prefer to keep a handgun. Charlie, like my article explains, this is outdated & I strongly suggest you use another resource. I would suggest you read this: http://www.sled.sc.gov/SCStateGunLaws1.aspx & if you have questions after that, contact the state gun rights group here: http://www.scfirearms.org/ Maybe see if they have a FB group where you can ask questions. Sorry I couldn’t help you! Screw South Carolina.. Wow, what a police state.. SEems like the 2nd Amendment doesn’t have much bearing there. I think even North Carolina has way better gun laws than South Carolina. With the way the strict gun laws are written in South Carolina, you can become a criminal almost immediately. The whole cannot carry a gun into someone’s home, church (OHHH 1st Amendment, Church and State!! Did you forget!?)) , a restaurant (PLEAASSE!) and other totally idiotic restrictions pretty much makes conceal carry and 2nd Amendment pretty well void is the state of South Carolina. Anyone who thinks southern states are very free and conservative has their head up their backside. They are dixiecrats down there, even if they vote Red. I was also shocked to see how high South Carolina’s taxes are, which are 7% and 6-7% sales tax. I’m still scratching my head, Red state? Yes, I also find SC gun laws restrictive, although they are slowing getting better! This article is 2 years old, so some of it has changed. Like I’m 99.0% sure you can now carry in restaurants so long as you’re not drinking. Better look it up to be sure before you do it… Probably the one law that annoys me the most is you must ask permission before carrying in someone’s home – having to ask is just awkward all the way around. And for a Virginian who can carry pretty much anywhere, I feel like I have to really be on my toes when carrying in SC! …handgun is secured in a closed glove compartment, closed console or closed trunk, or in a closed container “secured by an integral fastener and transported in the luggage compartment of the vehicle.” The handgun may be loaded. If the person has been issued a concealed weapon permit pursuant to state law, the person also may secure his weapon under a seat in a vehicle, or in any open or closed storage compartment within the vehicle’s passenger compartment, or concealed on or about his person in the vehicle. The ‘luggage compartment’ means the trunk of a motor vehicle for vehicles that have a trunk; for vehicles which do not have a trunk, ‘luggage compartment’ means the area in which the manufacturer designed that luggage be carried or the area of the motor vehicle in which luggage is customarily carried. In a station wagon, van, hatchback vehicle, truck, or sport utility vehicle, the term ‘luggage compartment’ refers to the area behind the rearmost seat. And this is a bit easier to read: http://www.handgunlaw.us – Select SC as your state & then see the “RV/Car Carry Without a Permit/License” & “Places Off – Limits Even With a Permit/License” sections. Legal disclaimer: please note, I am not an attorney or law enforcement officer and all the information I provided is simply my opinion of SC law. Please verify all laws accordingly. A lot of these laws are crap! Why must we leave our firearm unloaded and locked in vehicle when entering a restaurant that serves alcohol. I have noticed this country is punishing the majority of people for the actions of a small few. If I am eating in a restaurant/bar and someone comes in with a gun will I have time to run outside unlock and load my weapon to defend myself and others? I’m ashamed of the lawmakers in this country for infringing on my rights! My family and I are going to Mrytle Beach S.C. this week. I have a valid PA carry permit. I want to take my gun, it’s a long ride. What can I do? Len, I’m not up to date on SC’s current reciprocity laws, so I don’t know if they recognize a PA permit. I’d suggest looking through here – http://www.sled.sc.gov/SCStateGunLaws1.aspx If that doesn’t answer your questions, you can also check out handgunlaw.us or call the SC State Police/Highway Patrol. Sorry I can’t be of more help! In SC u are not required to have concealed lisence correct? So are u allowed to carry your gun into nc without a license? can you conceal carry on the beach, as long as you have a vaild cwp ?